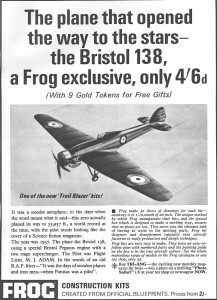 Frog announced in the beginning of 1964 a new range of 1/72 Aircraft to be known as ‘Trail Blazers’. 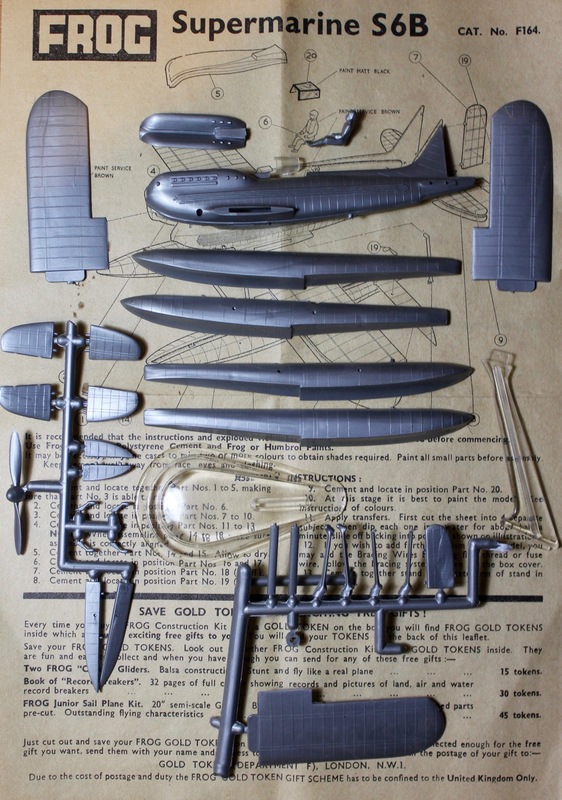 These were models of aircraft that had become famous for feats of aviation such as the Bleriot that was the first aircraft to cross the English Channel in July 1909, the High Altitude record in 1936 by the Bristol 138, and the Schneider Trophy outright winner in 1931. 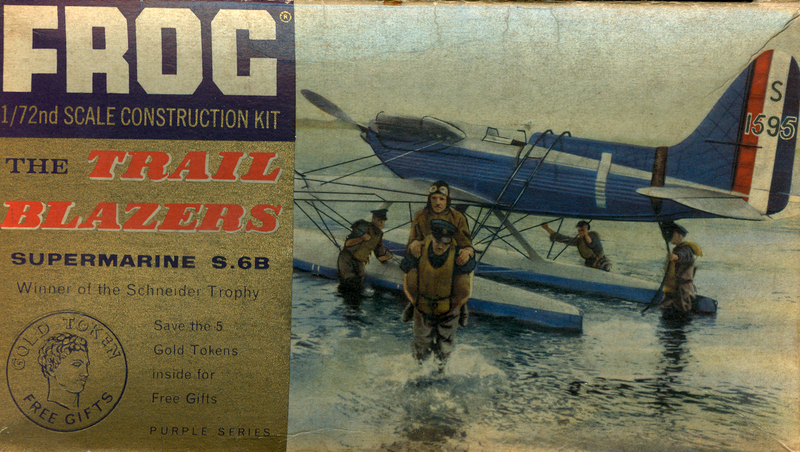 F163 Vickers Vimy (Spring 1964) F164 Supermarine S6b (the first to be issued and the only model in the purple range) F165 Bristol 138A (autumn 1964) F166 Spirit of St Louis (autumn 1964) F167 Westland Wallace (winter 1964) F168 DH Comet Racer (1965) F169 DH Gipsy moth(1965) F128 R-100 (1965 It was to 1/500 scale due to the huge size of the Airship. 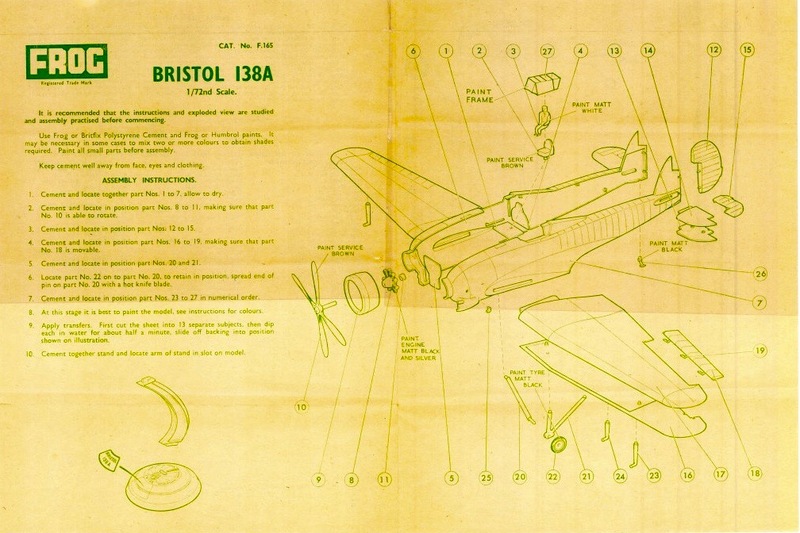 I have the original drawings in my collection) F173 Bleriot (1965) The final two issued in 1966 were F174 Gloster E28/39 and the F175 Southern Cross. in total eleven models were released between 1964 and 1966. 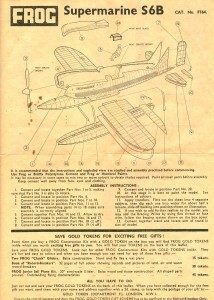 It is worth noting with the exception of the 1966 releases all the Trail Blazers carried ‘Gold Tokens’ a reward scheme introduced in April 1964 which when collected could be redeemed for gifts 15 tokens for instance would get a “Chuck Glider” 30 a book on speed record breakers and 45 a Junior sail plane kit. 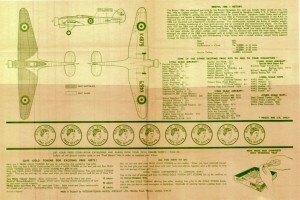 The tokens were printed on the instruction sheets and had to be cut out. 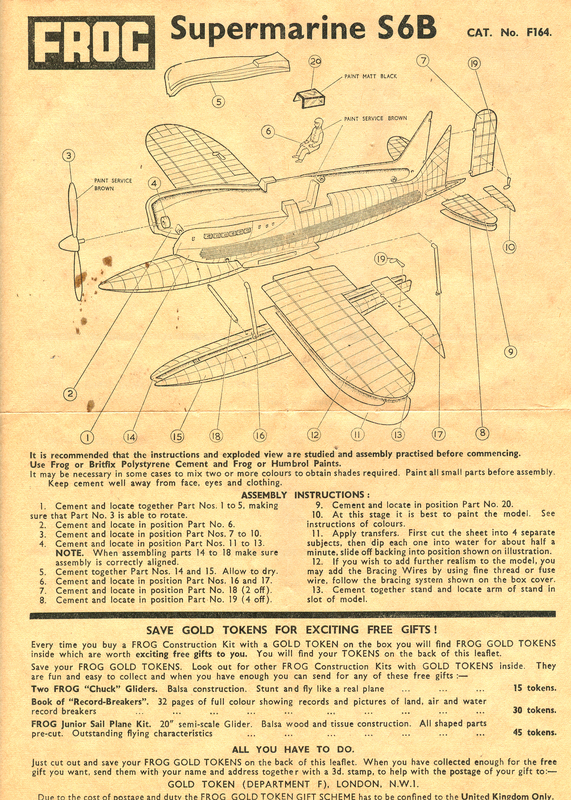 When the scheme closed in December 1965 a lot of models appeared with stickers on the boxes stating “Gold token scheme now discontinued”. 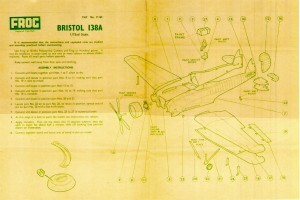 The painting guide on the rear of the box. The rather odd decal that Frog included in the Trail Blazer series. No mention of it was made on the box or instructions. 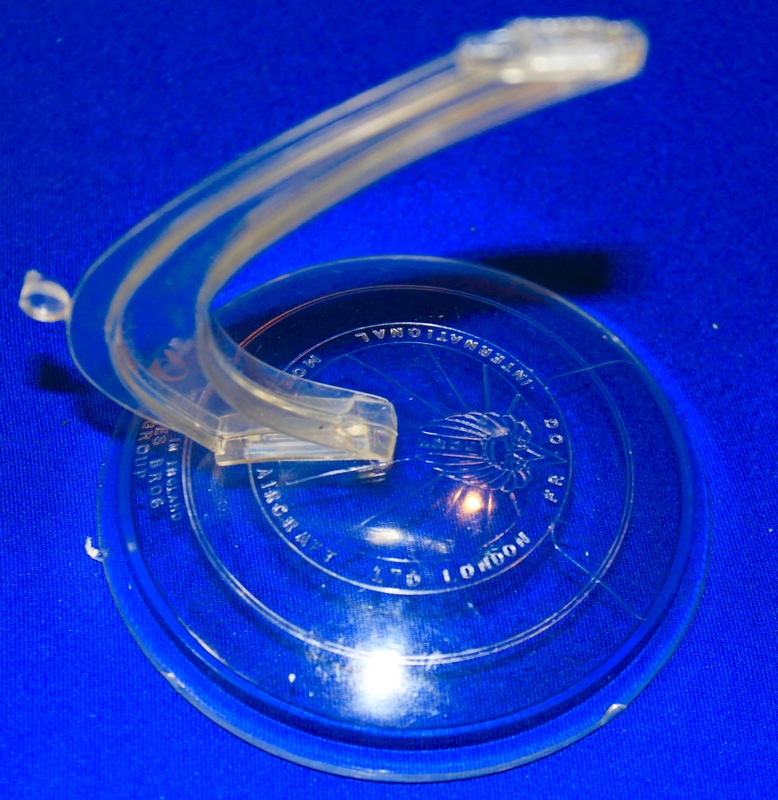 When I was taking the parts out of the box to photograph the 138 for this article I was very surprised to notice that this small tube of glue was still soft and had not hardened. This is surely a first bearing in mind it is 55 years old. 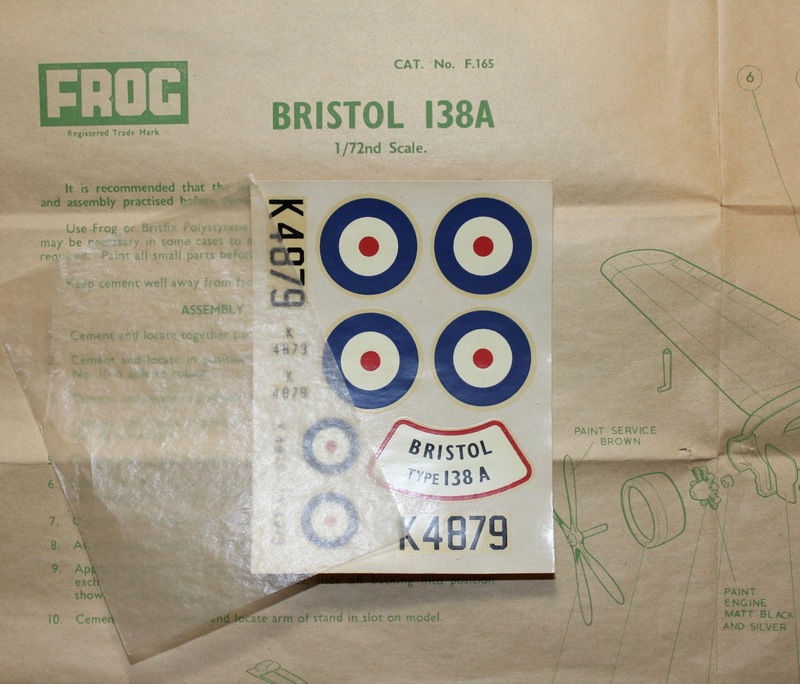 The first Trail Blazer is the S6B F164 however the Vickers Vimy has the number F163 which was issued after the S6B. 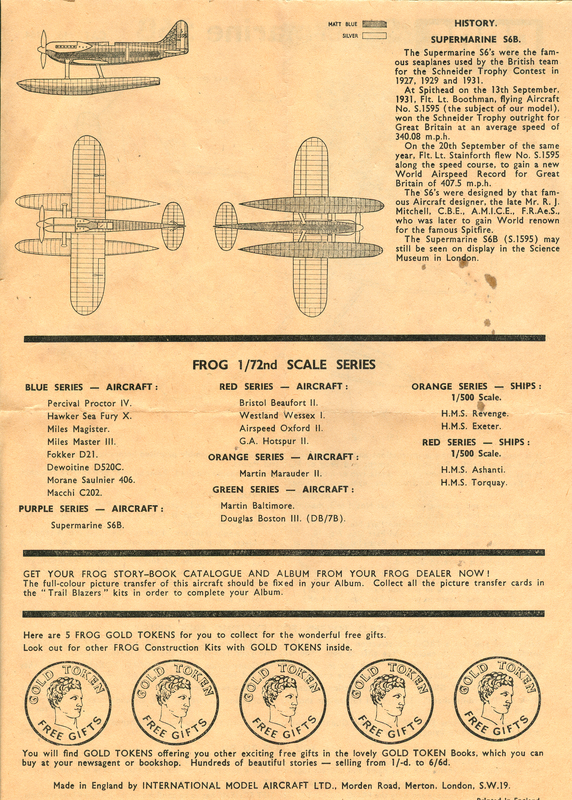 I have checked my primary source on Frog “Frog Model Aircraft Lines & Hellstrom 1989″ and can find no explanation. If anybody can cast further light on this mystery, please contact me. 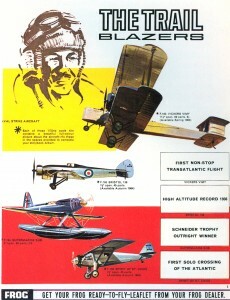 F164 The S6B The only model in the purple series and the first Trail Blazer. The bottom of the box was plain and did not have any printed painting instructions. It later became the Black series. 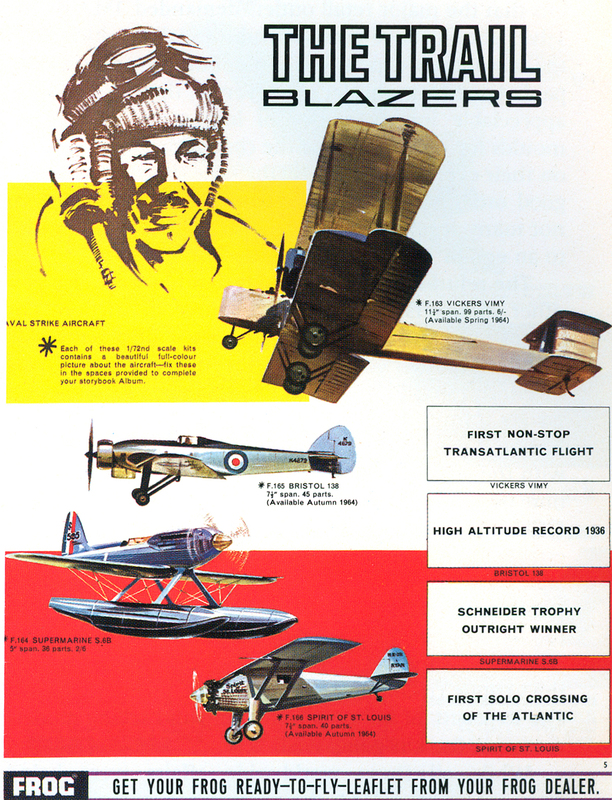 It is now half a century since the Trail Blazer series was discontinued (1966) but amazingly several of the models are still in production. 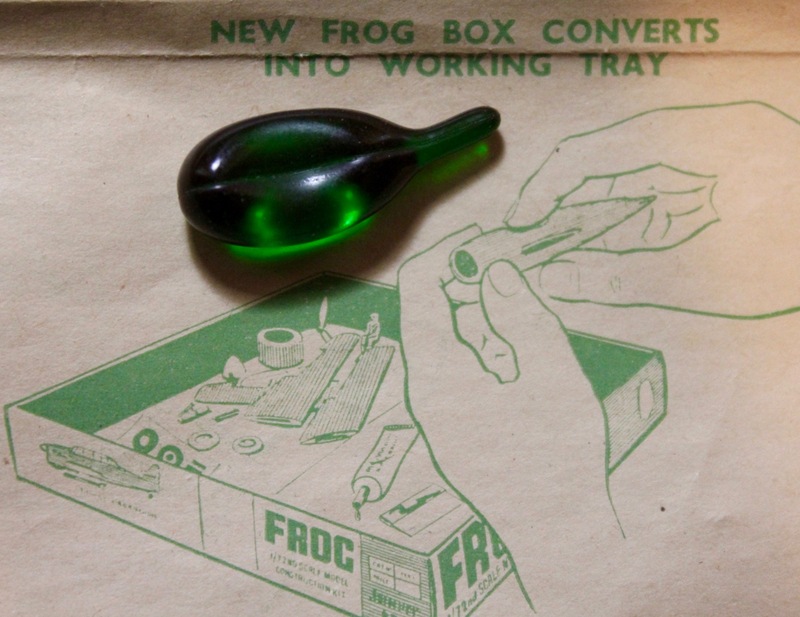 A tribute to the Frog mould makers. 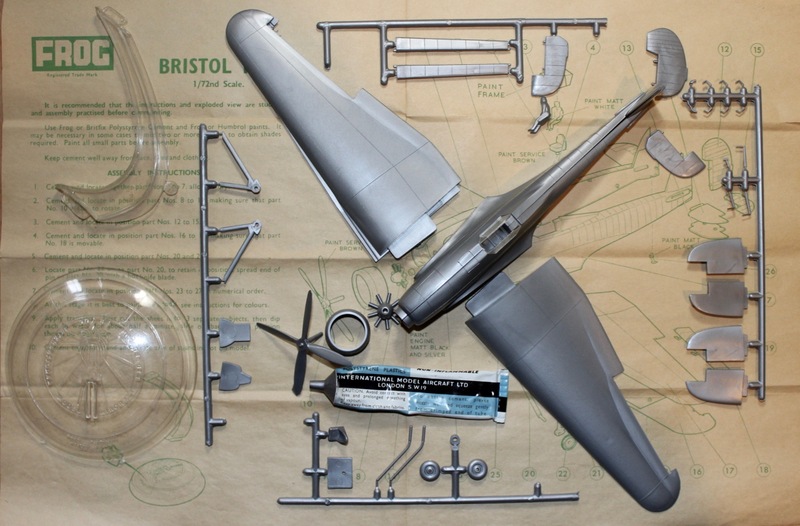 Models such as the Bleriot and R-100 still match up well to today’s releases. 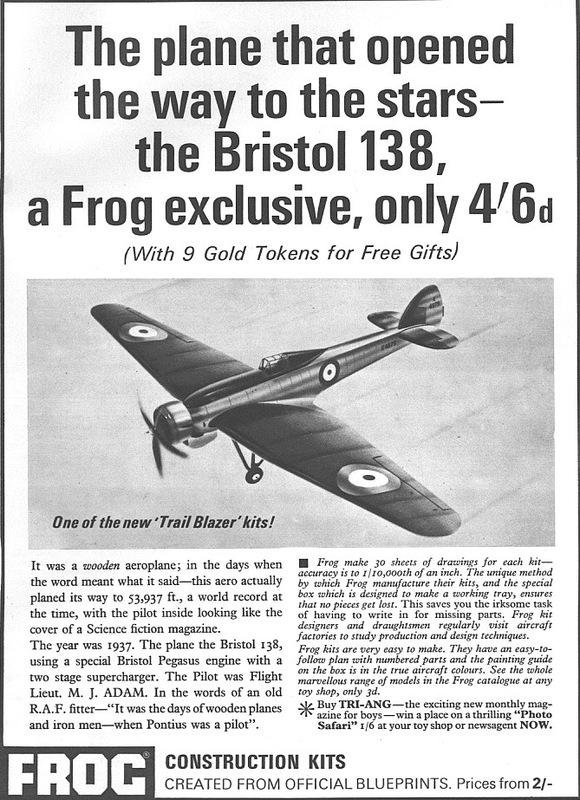 Without the Trail Blazer series would we have ever seen models such as the Bristol 138, the R-100, the Gloster E28/39 or even the Bleriot? 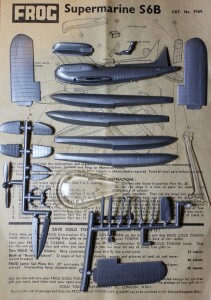 Each model had figures of the pilots and the Bleriot even had a base and French flag. 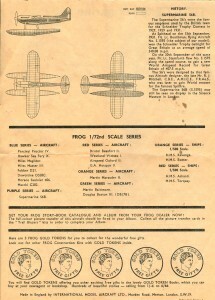 The R-100 of course included the Mooring Mast. 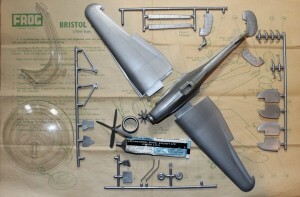 Part two will focus on further models in the series. 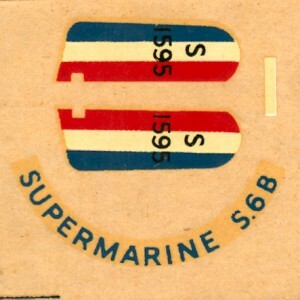 A total of 11 models were released as Trailblazers the first being the Supermarine S6B in 1964 as F164. 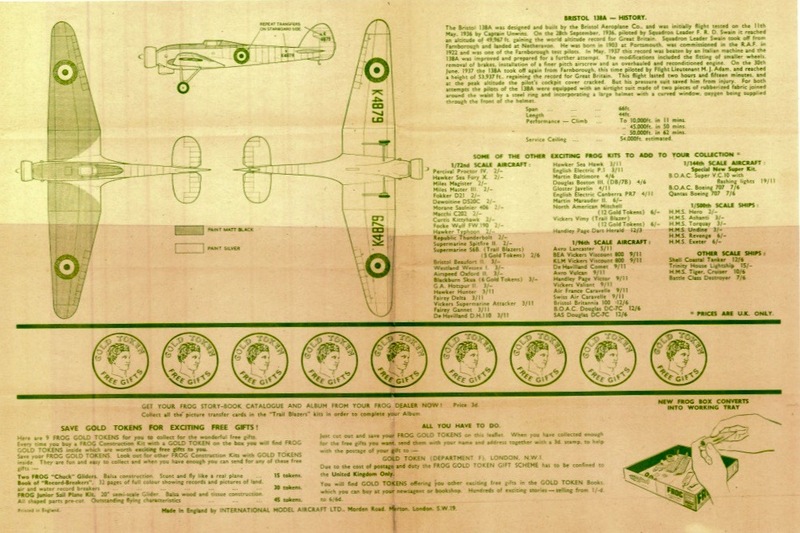 This was the first model to use the 'F' Prefix.